This is the concept at the heart of a recent investment by first tier automotive supplier The Linecross Group, in a new robot cell for their Cannock facility which will boost productivity, process repeatability and flexibility for the production of automotive components. The Linecross Group, comprising of Linecross and Linecross Composites, operates from two state-of-the-art manufacturing facilities in Rutland and Cannock, serving a number of market sectors including: automotive, commercial, leisure and mass transport. Linecross offers customers a holistic approach covering project management, product design and development, materials, production processes and decorative finishes. The company manufactures a diverse portfolio of components, some of which are produced at relatively low volumes but still require welding, joining or assembly. The mainstay of the ultrasonic welding process used by the company has, until now, been based on Telsonic’s HandyStar ultrasonic units. Simple and lightweight to use, these 35kHz systems have been used extensively by Linecross for a number of years for plastic welding, riveting and flanging operations on a range of internal and external automotive components and different materials. Although highly reliable and flexible, ultimately productivity and weld consistency are determined by the operator using these manual hand held units. 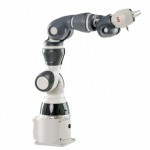 Pictured left: Intelligent component fixtures can be easily changed on the two workstations within the robot cell. 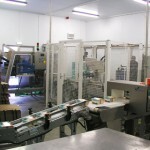 A general uplift in business levels, together with an increase in component volumes were the main catalysts behind the decision by Linecross to invest in automation. 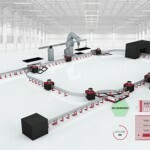 The proven track record of the ultrasonic process, and an increase in the use of this technology for welding and joining applications were also influential in making the move to automate the welding operations. 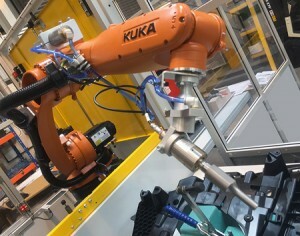 The new automated ultrasonic welding production system recently installed uses a Kuka 6- axis robot, which operates between dual workstations with intelligent workpiece fixturing, allowing different component part types to be processed while simultaneously loading / unloading. Directly mounted to the robot wrist is the Telsonic converter and sonotrode arrangement, powered by a Telsonic 35kHz MAG3512E generator system. 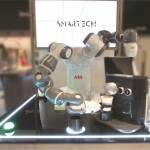 The robot-mounted system incorporates ambient and chilled air-cooling to allow repetitive welding on polymer materials which often require a high ultrasonic amplitude during processing. 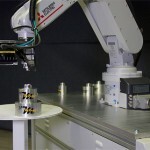 The ultrasonic sonotrode is positioned accurately and repeatably by the robot, to achieve the required number of welds on any individual component. 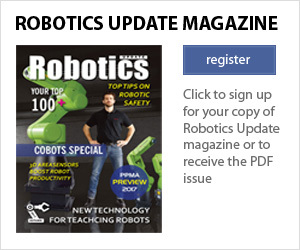 The dexterity of the 6-axis robot allows 3 dimensional spot welding and staking to be carried out with ease, and the rapid point to point positioning speed of the robot reduces the time between welds to a minimum. One of the benefits of automating this process will be repetitive positioning and orientation of the sonotrode for every weld on each component. 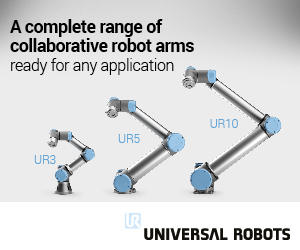 This, together with the consistency of the ultrasonic process, and the fact that the robot will never miss a weld, guarantees quality and consistency on all parts. 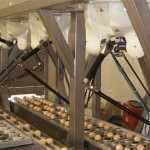 The existing suite of sonotrode’s used on the original hand held systems are fully interchangeable with the robot system. 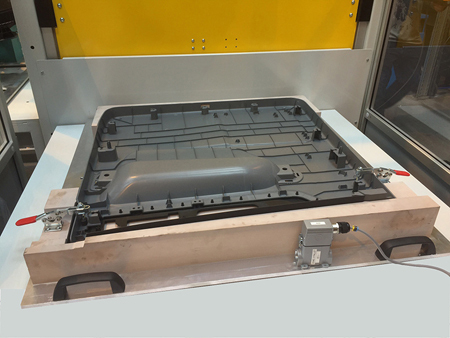 Linecross will use this new system to produce a variety of automotive components such as consoles, seat frames and under-trays, mainly in glass filled nylon. Telsonic has a detailed understanding of Linecross’ products, materials and welding parameters, as a result of a long-standing working relationship with the Group spanning a number of years and several different projects. 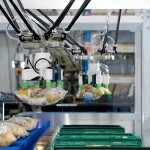 This knowledge was a valuable asset for the Midlands based system automation integrator to support the installation and application of the Telsonic equipment to the robot system.